Most people seem to go with Night of the Living Dead, some go with Dawn of the Dead but very few go with my personal favorite in Romero's of the Dead films, Day of the Dead. All three films have satirical elements that elevate them above the splatter fests that they are often reduced to, but this one has a trump card... Goblin. They provide the driving synth soundtrack to the film that gives it an other worldly quality that never really allows you to feel comfortable. Best known for there work with Dario Argento Goblin had a short but impressive career scoring some of the most iconic horror films of the 70's and 80's. Day of the Dead follows a group of survivors held up in an underground military facility located off the coast of what I assume is Florida. Very few of the characters in this film are believable but something about them is intriguing. I love the setting of the film and the anti-war theme of the film. At times the film feels like it is drawing from The Stanford experiment and others feel like nothing else that I've ever seen. The makeup effects in this film completely outshine the work done in Romero's earlier zombie films. I think this is the first film that Greg Nicoterro worked on. I could be completely wrong about this point and while it would be easy enough to look up that bit of information I'm positive that he has a cameo in the film so its safe to assume he worked on the practical effects as well. If you've seen The Walking Dead you've seen his work and say what you will about that show the zombies consistently look great in it. This was also the last Of The Dead film before CGI. I know this makes me sound like a grumpy old man but CG blood looks silly to me. They haven't quite figured it out yet. I understand that it keeps production costs down but it pulls me out of the film. Some of the best acting in the film comes from Sherman Howard playing Bub. It must be difficult to perform beneath all the makeup but Howard pulls it off. He gives a tragic performance that garnishes sympathy unlike any other performance in the film. He is in a way this films Gollum. 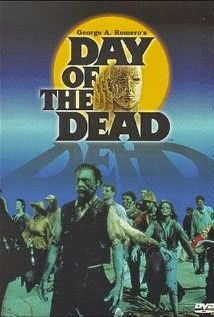 Day of the Dead is currently streaming on Netflix but I have it embeded below thanks to the fine folks over at Hulu.